Thought provoking Singer/Songwriter eyewall Paine made his debut back to Second Life last night at Living Room #13 after a musically enriched hiatus. New Yorker by birth and North Carolinian by choice, Eyewall is know on SL for his original and thought provoking music. I loved the words used by Juel Resistance in his announcement to describe eyewall; soulfelt, lyrical bleeding and acoustic ambiance. Duchess Flux: How would you describe your music? eyewall Paine: Ooh always a tough question, but atmospheric acoustic is what I like to call it, I guess. It is mainly mellow and melodic. Duchess Flux: Who are your biggest influences? The 60 minute set consisted of mostly original songs with a couple covers thrown in; Pink Floyd’s “Two Suns in the Sunset” and one of my favorite Leonard Cohen songs, “Famous Blue Raincoat.” However Eyewalls originals are thankfully the center of attention. The lyrics, “She dances across the event horizon – Into the shadows keeping time,” danced off his tongue in such melodic soul I found myself wishing to know more about this woman with the “golden whispers.” Eyewall ended his set with another soul-searching original, “The Outsider,” which to me, seemed to be an artistic song contemplating life-purpose and consequence. As I was crowd surfing, I noticed Bourque Rau looking ultra cool in this all black outfit. A quick conversation with Bourque proved she too loves her SL designers! 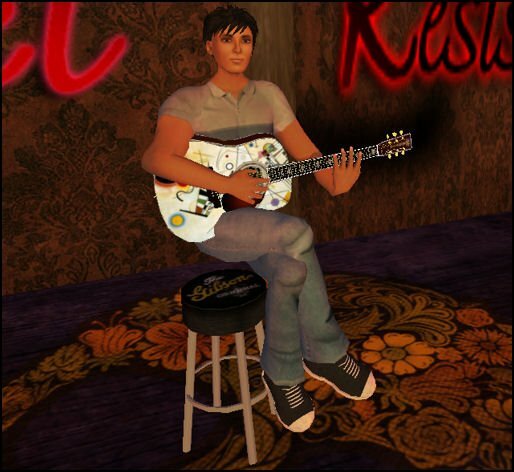 Check out eyewall Paine on Second Life for a nice set of mellow acoustic sounds by a talented songwriter. You can preview his songs on his MySpace page.